Managing IP’s next webinar, run in cooperation with Birch Stewart Kolasch Birch LLP, will take place on May 12 at 4pm (eastern standard time); 1pm (pacific standard time) and will discuss ‘Pitfalls in Post-Grant Trials’. The popularity of USPTO post-grant patent trials have only increased. Whether the PTAB institutes an inter partes review, a post-grant review, or a post-grant validity review of qualified business method patents, each trial has procedural pitfalls with considerable strategic considerations during the Second Phase of the trial (from the institution decision to the final written decision by the Board). This webinar will explore the most common mistakes the third party petitioner or patent owner during the 2nd Phase, with an explanation of key decisions by the PTAB (including those posted on the USPTO microsite) as well as the Federal Circuit. The focus will be on discovery, the patent owner motion to amend, oral hearing, and estoppel. With post-grant trials becoming increasingly popular, having an in-depths understanding of the pitfalls and challenges is essential for sustaining a strong presence in the market place. The live audience will be able to ask questions of the speakers during the webinar, which will be in English and will last one hour. Join Olivares and Managing IP for a complimentary webinar on May 14th at 4pm GMT/11am EST as we review the interplay between Cannabis and IP in Mexico. • Regulation of the use of Cannabis in Mexico. • Intellectual Property & Cannabis. • International trade law issues. • Cannabis business in Mexico from the corporate perspective. • Steps and predicted developments on the legal framework of Cannabis in Mexico. • Is data properly recognised in IP? •What is coaching and what isn’t coaching? •What type of challenges and goals can coaching help with? •What happens in the coaching process? •How do you find a coach and assess whether they are the right fit for you? The data trends do not lie: China will soon become the top filer of IP in the world, both home and abroad. What does this mean for your business? Join RWS and Managing IP for our webinar China IP Trends: the shift in patent filing as we take a look at the data and give you tips to stay ahead of your competitors. Guest speakers Justin Simpson, RWS, founder of inovia and Xia Zheng, founder, president of AFD China Intellectual Property, will review trends from WIPO and discuss important strategies for filing in China, including some of the advantages of their system and common mistakes even experienced filers fall victim to. Join RWS inovia, Minesoft & Managing IP Magazine for a complimentary webinar on March 30, 2017 at 3pm GMT/ 10am EST, as we review challenges and solutions associated with patent searching in China, Taiwan, Japan and South Korea. The webinar will also discuss filing trends in Asia compared to strategies in the West. On June 13, 2016, the United States Supreme Court decided that the two-part Seagate test being used to decide whether or not an infringer is subject to enhanced damages was inconsistent with the statutory authority (35 U.S.C. §284) relied on for those claims. How has that decision impacted the District and Federal Circuit Court rulings? Join Fitzpatrick and Managing IP for a complimentary webinar as we discuss Halo and the impact it has had on claims made under §284 in the district courts since June. The Defend Trade Secrets Act of 2016 provides the first federal civil cause of action for trade secrets misappropriation. Join us for a discussion of the cases filed under the new statute and an exploration of the emerging legal and strategic issues facing DTSA litigants. Topics to be addressed by the panel include the identification and management of trade secret assets to avoid their misappropriation; the strategic considerations for referring a trade secrets case to the criminal authorities after a breach has occurred; the primary differences between litigating trade secrets claims under state and federal law; and a review of the first wave of cases being filed under the new federal statute. Join RWS inovia and Managing IP Magazine for a complimentary webinar as we discuss Brexit and implications for the Unitary Patent (UP), the Unitary Patent Court (UPC) and other important patent related issues. The UP was established with the intent of providing a single European patent covering 26 nations. With the recent vote for Brexit, there is uncertainty as to when and how the UP will come into force. If it does, it may not include the UK, one of the largest economies in Europe. How will this affect your patent portfolio? Join us for the discussion! Following Brexit what are the implications for the UK, Europe, and beyond? How will this affect your filing and enforcement strategies? How will this impact the cost of receiving patent protection? An in-depth discussion and update on the federal Defend Trade Secrets Act of 2016 that became effective on May 11, 2016 including a review of the key provisions of the DTSA and the nexus to the Uniform Trade Secrets Act (UTSA) and the Economic Espionage Act of 1996 (EEA). Patent litigation and trials present unique challenges and opportunities for universities and other academic institutions. The panel will discuss these unique circumstances in depth, including national data on university patent litigation, effective university trial themes, PTAB validity challenges, university standing in patent infringement litigation, the assignment versus license of patent rights, and the enforcement of running royalty provisions. In addition, the panel will give an overview of successful enforcement actions brought by prominent academic institutions in federal court and the ITC, and provide the trial lawyer's perspective regarding what made these actions successful. 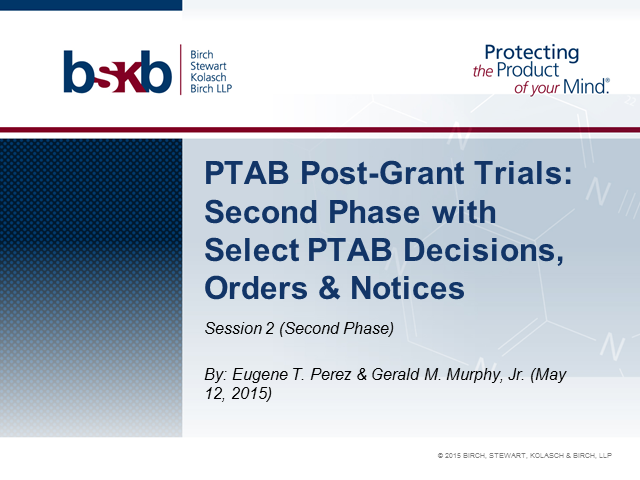 A discussion of an insightful statistical analysis of IPR and CBM trials at the PTAB. The analysis avoids pitfalls that obscure true picture of PTAB proceedings. More importantly, the discussion will address how the statistics should shape your PTAB trial strategies. The presentation is about a magic eight (ball). Not quite the answer machine you knew as a kid, but similar. Today your clients expect outside counsel to manufacture answers on demand. Answers about extrinsic risks, expressed in terms of what client stakeholders are doing in legal, technology and business terms. And they may want you to bring the answers to the table before they commit to the firm. You can't just shake the old 8ball for answers but you also can't cost-effectively predict problems before they arise. Or can you? Spend 45 minutes with Anaqua to hear from World Leading IP Strategist Barry Brager as he discusses 8 factors of insight you can bring to the table in your client development - far in advance of your next client win. Barry is a Certified Licensing Professional that brings a unique combination of expertise in entrepreneurship, analytics and marketing to the firm’s diverse teams, tools and techniques. In his role, Barry helps clients fully leverage innovation and IP strategy with a range of Expert Services from IP creation to IP monetization that have supported decisions related to billions in IP transactions. Broadcasting live from the MIP Africa Roadshow taking place on April 6 in New York, this 60 minute webinar will discuss the vastly different approaches needed to effectively protect your IP rights in Africa. Presenters: Simon Brown, partner and chair of trade marks department, Adams & Adams; Kevin Curran, global IP counsel, Ascensia Diabetes Care; Charles Macedo, partner, Amster Rothstein & Ebenstein; Jenny Pienaar, partner - trade mark litigation, Adams & Adams; James Nurton, managing editor, Managing Intellectual Property. Managing IP, in association with the Managing IP Women in IP Global Network, invites you to join a free web seminar focusing on leadership in the IP professions. The live audience will be able to ask questions of the speakers during the webinar, which will be in English and will last one hour. In this webinar Alyssa Harvey Dawson, Vice President of the Global IP and Licensing team at Harman, will share how Harman has leveraged technology and metrics to focus its IP strategy, optimizing its processes to support smarter, quicker decisions. Steve Preston, Anaqua’s Senior Vice President of Marketing, will join to discuss how other organizations are benchmarking their processes, and quickening their pace of innovation by leveraging technology. Managing IP’s upcoming webinar ‘Effective obviousness arguments in district court and PTAB’, held in association with McAndrews, Held & Malloy, will take place on November 4 at 5:00pm London time (12pm Eastern/11am Central/9am Pacific).